Yesterday we reported that Assassin's Creed 4: Black Flag won't get the exclusive content for PS4, but it is not a big deal, because today the developers have announced the special edition of the game with really unique and cool stuff. If you are fond of the assassins and pirates, then you will obviously like Assassin's Creed 4 Limited Edition. 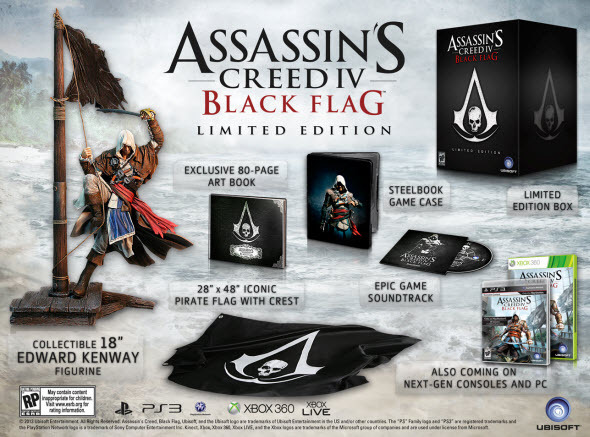 This pack consists of the game packed in the steelbook, the statuette of Captain Edward, the piratical flag with the game's sign, the art book and Assassin's Creed 4 soundtrack. All these treasures are available for PC, Xbox One, Xbox 360, PS3 and PS4 and cost $129.99. And for those who think that this Assassin's Creed 4 Limited Edition is too expensive, the developers have prepared another small surprise. They published a new game's video with the demonstration of the naval battles. This trailer tells us about dangerous and dissipated life of pirates and shows the beauty of the sea. Assassin's Creed 4 is coming to PC, Wii U, Xbox 360 and PS3 on the 30th of October, 2013 and to Xbox One and PS4 when these consoles launch.